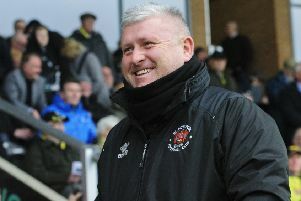 Last week this column commenced a series of articles about steps and principles to follow in order to reinforce our club’s DNA and move Blackpool FC forward into a new era as a well-supported, financially sustainable and successful community football club playing attractive, attacking football to its highest aspirations and abilities. It continues this week by looking further at the vital aspects of community interest and interaction. If you read the Blackpool Supporters’ Trust page in the homecoming Southend matchday programme, you might have noted two of BST’s key aims are: to help strengthen the bonds between club and community and to be a force for good in the town. Community involvement has always been a focus for the Supporters’ Trust. We are, after all, constituted as a Community Benefit Society. In the past we have raised funds for Variety Children’s Charity, MIND, AgeUK, Trinity Hospice and the Boathouse Youth project, in addition to seasonal foodbank initiatives and continued support for the Gary Parkinson Trust. It has always seemed entirely logical to us that BST would at some point work closely with the football club’s own Community Trust, but the political landscape just wasn’t right while the Oystons were involved in any capacity. That has all changed in recent weeks. BST committee members have met with BFCCT and we have started to plan how the Supporters’ Trust can assist in the work of the Community Trust, both at the football club and in the town. The first fruit of that collaboration will come on May 4, when BST volunteers will be assisting with Blackpool FCCT’s family fun event prior to the final home fixture of the season against Gillingham. The family fun event will take place in the North Stand car park from 3pm until kick-off at 5.30pm and is completely free of charge. There will be a variety of activities for all age groups to get involved with, from a bouncy castle and face painting to penalty shootouts and mega football on a giant inflatable pitch (and more to be announced). You do not need a match ticket to attend the fun day. However, BFCCT is able to provide almost 2000 free tickets for local families to watch the game after the event courtesy of sponsorship from Tower Insurance. Two hundred of those tickets will be available to the public through competitions running across social media platforms with further details to follow. It has been a big concern for BST that the years of boycotting might have lost Blackpool a generation of fans. Events like the family fun day are a great way to engage young people who have not been to watch Blackpool. Those with children are encouraged to bring them along to enjoy the event and make that connection with our football club – it could be the start of a lifetime affiliation. In conjunction with Blackpool Food Bank, there will be a donation point for tinned foods, pasta, pasta sauces, tea, coffee, long life milk etc. in order to create emergency food parcels for Blackpool residents. As with our Christmas appeal, if you can help please bring something along to donate on the day; again, further details to follow. The interim board of Blackpool FC is running a very tight ship at the moment. As stated last week, good revenue streams are vital, which is why maximising bums on seats and merchandise sales are so important between now and the end of the season. It might be the reasoning behind putting a number of football club-owned housing lots up for auction. It also illustrates why the volunteer force that continues to do such sterling work in cleaning up the stadium before and after home games is a valuable asset in the present straitened times. The suggestion from some quarters that these ought to be paid jobs is understandable, and once new owners are in place and the club’s finances have improved that may well be the path forward, but right now it is not practical. Therefore BST will go on co-ordinating volunteer man – and woman – power to keep our stadium fit for use by Blackpool and visiting fans on matchdays. It is just one aspect of community involvement now we have got our club back and it exists as a matter of course in many a Football League club up and down the country. Thank you to the hundreds who have already signed up to the volunteer force and given of their time. If you haven’t, but would still like to do so, just email deputychair@blackpoolsupporterstrust.com to get yourself on the volunteers register. That leaves issues of the matchday experience, the importance of supporter liaison officers and structured engagement between club and supporters to be addressed in this column next week. In the meantime, get on down to Bloomfield Road tomorrow and let’s cheer on the Mighty to victory against the Posh.